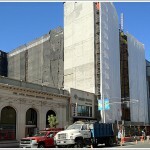 Having sold for $65,000 in early 2008, parking spot #142 at 88 Townsend Street resold for $38,000 in October of 2011. Listed for $85,000 last month, the parking spot which can be used or leased by a resident or non-resident of the building, is now in escrow. This will be a really interesting datapoint. I would love to see posts/comments from any readers of this site who have reliable data on the value of a parking space in different SF neighborhoods–e.g., data from the sale of a parking space (like this), or from near-in-time sales of otherwise comparable units with and without parking. I remember 5-6 years ago in Russian Hill they were trying to sell parking spaces for over $100K (a building near Hyde & Green). I’m sure today it’s still well over $60K in that area but I have no updated data point. The key takeaway, for me, is that at an average of 325 square feet for a garage space (including access), the price is ~$260/sf– obviously well below housing, and probably well below uses like ground floor retail (which are the most directly comparable to my mind). So parking is still being oversupplied. …and that the typical spot is more like 8′ x 20′, even make it 10×20, still only an av of 160 to 200 sq ft. So up that psf to more like $300-500! Given that there will be less parking built in the future (DBI’s reduced requirements, harder to add parking to existing structures, etc. ), I’d say that dependin’ on the hood, the value of a parking space has a bright and rosy future! Um, you have to include at least some of the space that allows a car to get to the actual spot in that cost. Umm…not always. 1- Single car, straight in garage. 2- larger lots that average the in/out space with stalls that are only 8×15. You can nustify a wide range of valuations depending on your discount rate and the rent you can charge. ^If you can show me any garage that averages total space of 160-200 sq ft I’d be surprised. If it’s straight into the spot then clearly that space can be swapped as living space since it would be above ground. Not a lot of living space going for the paltry $300-500 per. You can actually average parking areas easily on Google Maps or Earth. Turn on the distance measuring tool (in “Labs”, I think), and find a nice rectangular parking lot. Count the stalls, measure the area, and you’ve got your result. 325 is not an overestimate. UPDATE: The New Price For A Parking Spot In South Beach: $82,000. Boston’s got San Francisco beat.